Take a closer look at this beautiful new pet cremation urn. 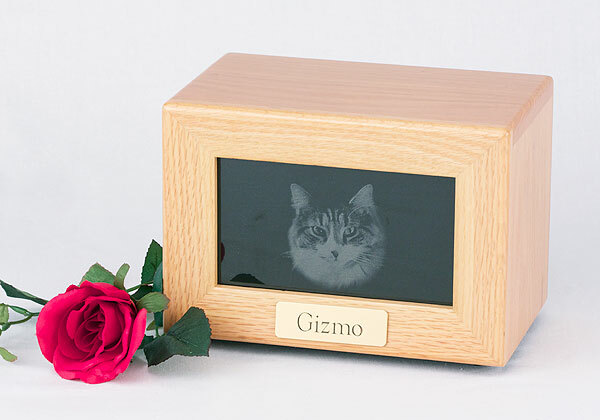 This memorial design transfers your favorite pet photograph (with any desired editing) onto a 5" x 7" black marble tile using laser technology. The tile is then installed permanently by us prior to shipping. Please email your favorite photo to: [email protected] -- please note that horizontal photos are preferred. To get the best out of your purchase we recommend a photo of at least at least 300 dpi resolution. If you have a digital camera this will produce the best pictures. Most camera phones are only 72 dpi. Please allow 1-2 weeks to receive your memorial after approving our emailed proof. Choose from dark walnut or red oak. Each urn comes with a premium brass nameplate with up to 4 lines of engraving to personalize your memorial. This urn has two compartments which you access from the removable bottom. 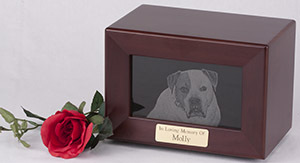 The 1st compartment holds the laser engraved marble with your pet's image while the 2nd has 95 cubic inches of space inside, accommodating pets from 0-95 lbs.